Hi guys! Welcome to #3DaysofLaraJean, in which I celebrate all things pretty, lacey, and sweet about Lara Jean Song Covey, the heroine of Jenny Han’s To All the Boys I’ve Loved Before series. For the next three days, I’ll be reviewing the final two books of the trilogy and sharing some of my favorite moments and thoughts about what has become one of my favorite contemporary series. Also! 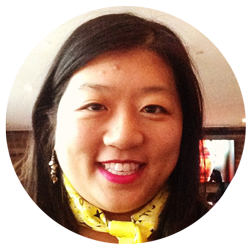 Jenny Han will be stopping by the blog for a Q&A in which I talk all things Lara Jean (and Belly-Conrad-Jeremiah) with her! And…there’s a Canada-wide giveaway for all of you Lara Jean lovers. So, without further ado, let’s chat about PS I Still Love You! 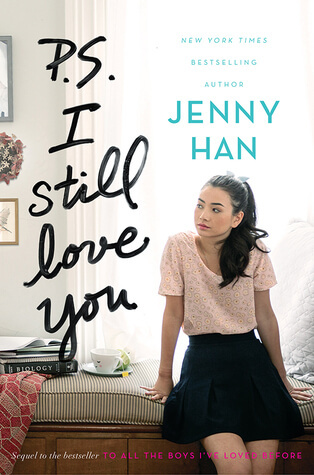 I already reviewed To All the Boys I’ve Loved Before a few months ago, and since we’re already past release date for Always and Forever, Lara Jean, I thought I’d do a fun post on the things I loved about PS I Still Love You. If you’ve already read the book, I hope this will be a great reminder of all the amazingness in book 2 of this series. Minor spoilers for this book and To All the Boys I’ve Loved Before. Epic Cake Competition: I mean, if you love Lara Jean, you probably like talking about baked goods, right? PS I Still Love You sees Lara Jean entering an amazing cake competition, and I was basically salivating the whole time. Harriet the Spy would excel at Assassin. A High-Stakes, Elaborate Game of Spy Tag: Aka Assassin. It’s basically the most sneaky, stalker-ish game of tag ever, where when you’re out, you steal the next person’s target. And it goes on for weeks. I seriously need to do this with my friends! Costume Parties: MAN, Lara Jean loves dressing up. And she loves throwing a good party. So nothing made me more excited than the fact that she gets to throw a USO themed party. Think Rory in this Gilmore Girls episode. I CANNOT with this, you guys. Messy Relationships: Like To All the Boys, like many of Jenny Han’s books, the story and the characters are messy and all twisted together. And the choices that Lara Jean makes are not always ones that I would make (yes, I’m talking about her romantic choices as well as her friend choices). But that’s the beauty of these books. The realness of making sometimes imperfect choices. The recognition that friendship is not fixed or easy. The acknowledgment that not everything is perfect, but you still find magic in what you have. You guys, I could have listed at least five other things that made me really enjoy PS I Still Love You (Kitty’s sleepover! The Peter K necklace! Jamie Fox-Pickle! Lara Jean’s dad! STORMY!). For me, though, it’s one of those books where the whole was not quite the sum of its parts. At the end of this book, I felt like only a few things had gotten unraveled…which is why I was so glad to see that there was a third book coming out. Reading PS I Still Love You swung me from euphoria that Lara Jean had gotten together with Peter, to horror and frustration at a really nasty social media situation, to feeling like Lara Jean had a better romantic option, to realizing just what Lara Jean’s growth was going to be in this book. Out of the three books, I think it’s the loosest, but it also has so many moments and elements that made me happy that I couldn’t help but love it. So my question to you: How did you feel about PS I Still Love You? Did you love it? Are you a fan of John Ambrose McLaren? Were you confused by it? Did you feel like it was open-ended? And are you just as happy as I am that Always and Forever, Lara Jean happened? If you guys have seen Jenny’s Instagram, you know this stuff is COVETED. If you’re in Canada, sign up now! This is a short giveaway, I’ll be picking a winner next week. So sadly I don’t live in Canada and can’t enter but I just finished my re-read of the first book today and already hopped onto Book Depository to grab the other two so I can read and love them both and just fangirl over the cuteness of Lara Jean and her family! This is honestly one of my favourite series for how heart warming and adorable it is! Haven’t read any of the books but definitely interested! ooh, I just love this series! Admittedly I’ve only read the first one but it was the best. I need to read the next two. I’m so excited for the Q&A! I haven’t read any of this trilogy yet although I’ve been meaning to get started on them. Now that the last one id out I have no excuse! I like happy, sweet books in the summer so these would be perfect! These have been on my TBR list for a while. I’d love to read them all. Thanks for sharing your book love Tiff. I don’t need any reasons to read this book, because I <3 this series! I love that tag game part, it was really fun! I also can’t wait to read Always and Forever because I want more John Ambrose McLaren! I read and loved To All the Boys I’ve Loved Before, but haven’t read PS I Still Love You yet. I love how Lara Jean is just a regular girl, very relatable and easy to like and connect with. Now that the third book is out I should bump them up on my TBR! For some reason I only read the first book in this series, but I really loved it. It has such a sweet feel and I love the baking aspect. I’ll have to read the next two books soon!! I have read to All The Boys I’ve ever Loved and I own the second book but haven’t got around to read it yet. I loved the storyline, it was perfect. I loved the first two books, sometimes triangles are tricky for me, but I liked the one here because both guys were legitimately good options, I didn’t dislike Lara Jean’s scenes with either one, which is where it usually goes wrong for me with a triangle, where I’m like can we just get back to the parts with that other guy instead. I think I literally went out and got a copy of this book from the library the day this review came out. I’m reading it right now and some of the scenes are SO CUTE and the dialogue is gold, even when Lara Jean was panicking about the video situation (which sounds horrifying!). Haven’t gotten to the love triangle part yet, but I had a feeling it was gonna be John Ambrose McLaren because of what happened in the first book. I’ve only been able to read the first book in the series but I am so excited to continue! These books are definitely interesting and so good! Lara Jean and the whole clan are the cutest! I actually have not yet read any books by Jenny Han but have heard lots of praise for her books! This series seems to me to be great summer beach reading! Thanks for the chance to win. I have read the first two books and I really enjoyed them. I like the diverse characters and the relationship between Lara Jean and her sisters. I really want to read these books so badly. I was going to read them a bit ago but then I heard Always and Forever Lara Jean was coming out so I thought I would wait until it came out to read them. The covers are so beautiful and I’ve heard nothing but good about them! I haven’t read these books yet but my friend has repeatedly recommended the series to me! I have read the first two books this past summer during my first and second year of grad school. I knew that Jenny Han was an Asian writer in the YA world, but I never sought her out until recently. I also love that Lara Jean is very much her own well-rounded person even though her indecisiveness and naivety can be annoying which I think is what Han intended. I would love to get my hands on this trilogy as I’m on bed rest for the next two weeks after ACL surgery. the completed articles. So, I guess, woth regards to London, you have to make rough with the smooth. because vehicle that will dohument what we think andd thast which you do. I felt that the second book was good but yes I didn’t always agree with the choices she made in the second book and I felt that the third book wrapped it up and showed more of her growth process! I want to reread these books before the Netflix release! Without betting a cent of his own money.